Windows XP Recovery, Windows 7 Recovery are the same fake Defragmenter tool (rogue) from the same family as: FakeHDD. It adapts its name from the OS it infects. 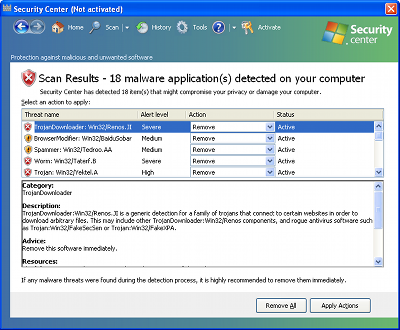 Windows Activity Inspector is a fake security application from from the same family as: Windows Protection Servant, Windows Activity Inspector, Windows Tweaking Utility, Windows Tasks Optimizer, Windows Work Catalyst , Windows Attention Utility, Windows Inspection Utility, Windows Supervision Center, Windows Oversight Center. This rogue displays fake warning messages pushing users to buy a license. If your PC is infected with Windows Activity Inspector use MBAM to remove the infection. Essential Cleaner is a new version of MS Removal Tool, System Tool, Security Tool, Total security 2009, System Security rogue. This fake anti-spyware tool displays fake alert messages, prevent execution of legit programs, detects inexistent infections and Hijacks desktop background to scare users. Windows Protection Servant is a fake security application from from the same family as: Windows Activity Inspector, Windows Tweaking Utility, Windows Tasks Optimizer, Windows Work Catalyst , Windows Attention Utility, Windows Inspection Utility, Windows Supervision Center, Windows Oversight Center. This rogue displays fake warning messages pushing users to buy a license. If your PC is infected with Windows Protection Servant use MBAM to remove the infection. Windows Activity Inspector is a fake security application from from the same family as: Windows Tweaking Utility, Windows Tasks Optimizer, Windows Work Catalyst , Windows Attention Utility, Windows Inspection Utility, Windows Supervision Center, Windows Oversight Center. This rogue displays fake warning messages pushing users to buy a license. 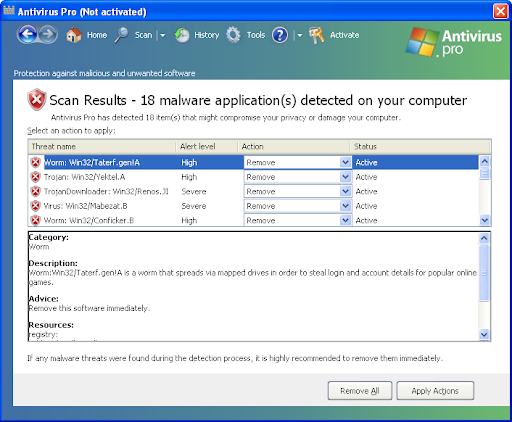 Antivirus Pro is a fake security application (rogue) from the same family as: Antivirus Center, Internet Protection, Antimalware Tool, System Defender, Internet Defender, Security Defender, Antimalware Defender. 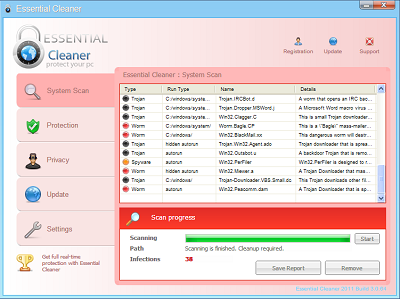 It displays fake infections to push users into buying a license. If your PC is infected with Antivirus Pro use MBAM to remove the infection. 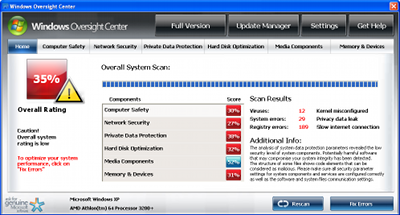 Windows Tweaking Utility is a fake security application from from the same family as: Windows Tasks Optimizer, Windows Work Catalyst , Windows Attention Utility, Windows Inspection Utility, Windows Supervision Center, Windows Oversight Center. This rogue displays fake warning messages pushing users to buy a license. If your PC is infected with Windows Tweaking Utility use MBAM to remove the infection. 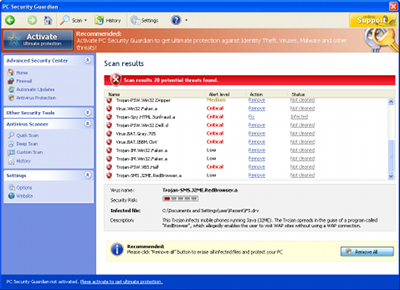 Windows Attention Utility is a fake security application from from the same family as: Windows Inspection Utility, Windows Supervision Center, Windows Oversight Center. This rogue displays fake warning messages pushing users to buy a license. 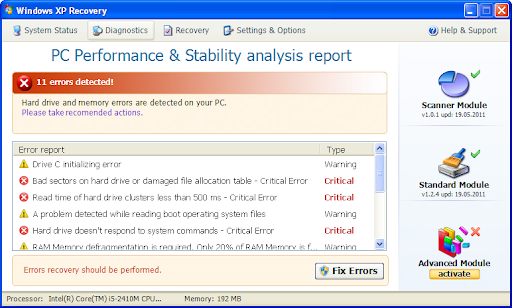 If your PC is infected with Windows Attention Utility use MBAM to remove the infection. Windows Inspection Utility is a fake security application from from the same family as: Windows Supervision Center, Windows Oversight Center. This rogue displays fake warning messages pushing users to buy a license. If your PC is infected with Windows Inspection Utility use MBAM to remove the infection. Windows Supervision Center is a fake security application from from the same family as: Windows Oversight Center. This rogue displays fake warning messages pushing users to buy a license. 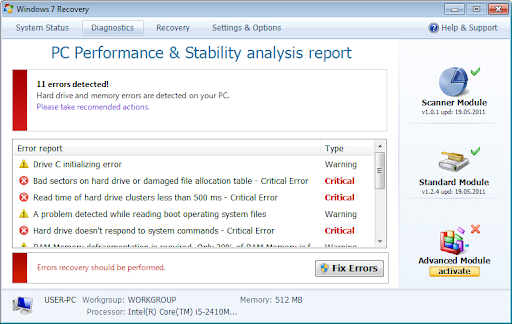 If your PC is infected with Windows Supervision Center follow Bleeping Computer's removal guide. Windows Oversight Center is a fake security application from Tritax family. This rogue displays fake warning messages pushing users to buy a license. If your PC is infected with PC Security Guardian follow Bleeping Computer's removal guide.